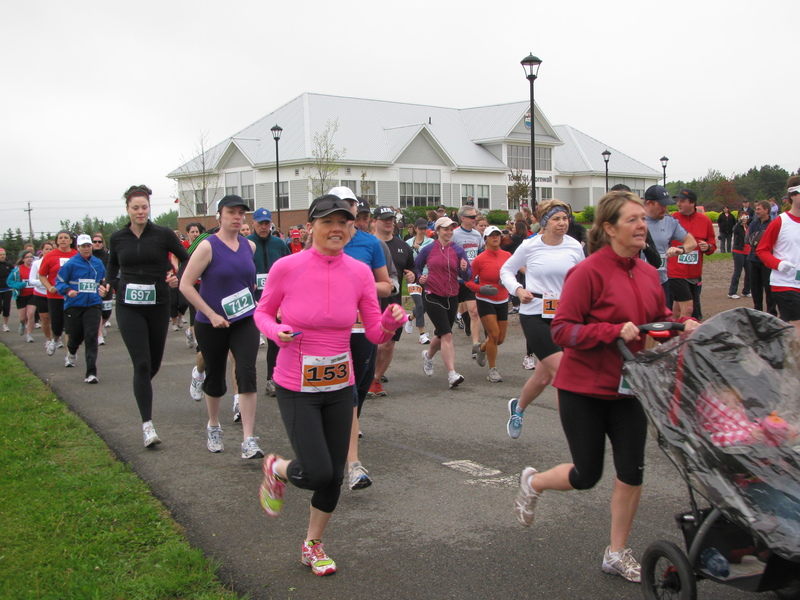 The Cornwall Classic run was yesterday, a great fundraiser for KidSport PEI, giving participants the option of a 5 or 10K run. I chose the 5K. My goal was to simply finish without having to stop and walk, and I’m so pumped to say I did it! Roughly one year ago, I ran my first ever 5K race…my first ever 5K run…and I ran outside for the very first time ever…all on the same day. That race I finished at pretty much 30 minutes even and I didn’t stop to walk either. I did, however, wear my knee brace, and the course itself was relatively flat. Fast-forward one year. I ran sans knee brace and chose a race that pretty much consisted of hills and had the last 1K of the race totally uphill. I finished on-the-clock at 30:34, but I did stop to check on a friend’s daughter when she fell and I slowed down at the end to allow my 3-year-old to finish the race with me, so I’m guess-timating my finish time to be around 29 minutes. Whatever, the real time, I’m super duper proud to have finished. The first 2.5K was pretty easy. I had my husband and a good friend running with me and we spent a good part of that time chatting and catching up. I got to see some of the newer homes being built that I’ve never seen before, and the buzz of the crowd was pretty awesome. At the half-way point, I threw off my sweater (oh I forgot to mention, it was bloody cold out to start!) and got down to business. This is the mark where I usually let myself walk for 2-3 minutes. Not this time. And it went pretty well, too, until that last 1-1.5K where the hills just started to get to me. I did slow down, but I didn’t walk, and my co-runners were pretty awesome to keep me motivated (thanks Allan and Julie!). Of course, there’s nothing like that feeling when you round a corner and see the crowd cheering you on. 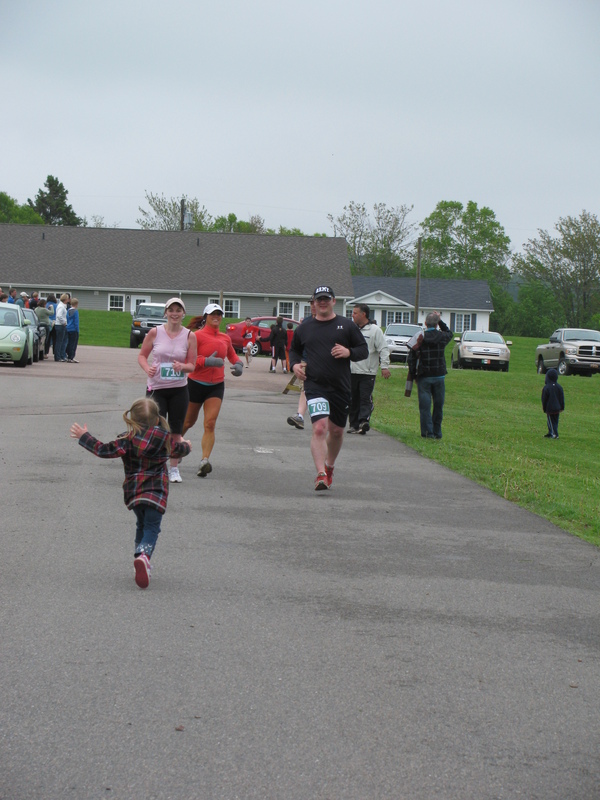 Oh wait, yes, there is something that beats that: seeing a very excited 3-year-old wondering if she could finish the race with me. I had told Kait to watch out for me and if there weren’t a lot of people around, she could run toward me and we’d finish together. The look of her face when I slowed down and told her to come on was amazing. I’m already thinking I’ll do that exact same race I ran last year again, which is in 2 weeks. Oh, and since I get to buy myself a snazzy new running skirt b/c I met my goal yesterday, I’ll have to think of a new goal for the next race. 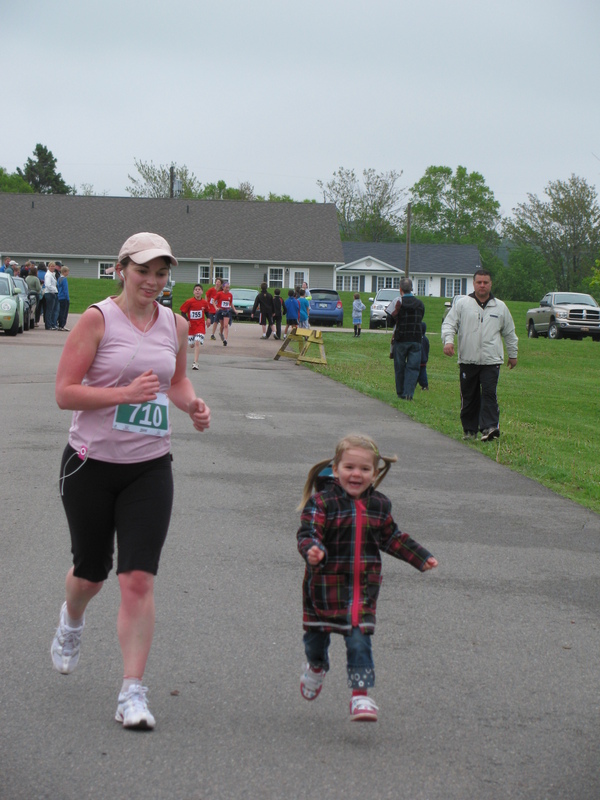 This entry was posted in 5-10 km, Running with your kids. Bookmark the permalink. I love this picture and how excited Kait looks 🙂 We are setting some great examples for our kids! Great pic. Good day for a run. She looks so joy-filled and that’s how it should be! Congrats on your run & on being such a good example…both always a good feeling.